The first description of Parkinson's disease (PD) was given by James Parkinson in early 19 th century. But the knowledge about this disease has been present in India since ancient times. Though the prevalence of PD in India is less compared to other countries,  the total burden of PD is much higher as a result of large population. We reviewed all the published literature on PD from India till date. This will help in giving a comprehensive outlook regarding the previous and the current situation of this disease in our country. This review will also elaborate the contribution of India in the field of research in PD. The search results have been given in [Table 1]. A total of 95 articles were according to the search criteria. The first published article from India on PD in indexed journals could be traced to 1988. In later years, the number of publications has steadily increased [Figure 1]. There are more publications in international journals (n = 76) than in national journals (n = 19). We attempted to categorize the articles on various aspects, such as clinical, epidemiology, genetics, pathogenesis, investigations, pathology, treatment, social issues, and physical rehabilitation. Of these, clinical aspects, nonmotor involvement (n = 33) and genetics (n = 25) were the most commonly studied categories [Table 2]. Most of the articles are published from only a few number of research institutes. 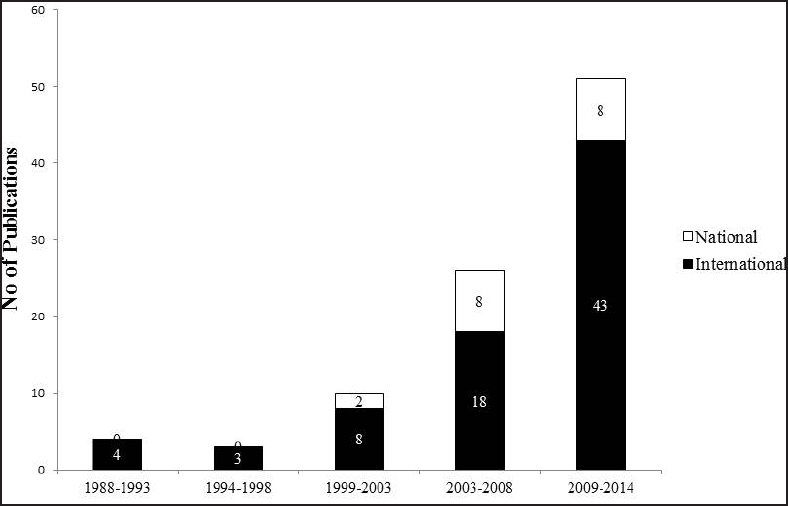 Of the 95 articles, 86 were published from four institutes [Figure 2]. Further in this review, we elaborate the findings of the studies done on PD on patients from India. In a review by de Lau and Breteler in 2006, it was reported that an estimated 10 million people in the world (i.e., approximately 0.3% of the world population) and 1% of those above 60 years are found to be affected with PD. There are very few population-based studies determining the exact incidence and prevalence of PD in India. In a door-to-door survey done in Bangalore district in South Karnataka in India in 2004, the prevalence rate of Parkinsonism was found to be 33 per 100,000 (crude prevalence) and 76 per 100,000 (age adjusted). Rural population had a higher prevalence compared to the urban population (41 vs 14). But it was less compared to other highly prevalent neurological disorders such as headache, epilepsy, stroke, and mental retardation. From a survey in Kolkata in 2006, the prevalence of Parkinsonism was found to be 45.82 per 100,000. In the state of Kashmir,  the prevalence was 14.1 per 100,000, while the age adjusted prevalence was 134 per 100,000. A survey, done in Parsi community in Mumbai, a small stable community,  showed a prevalence of 192 per 100,000, which was higher compared to rest of the population. In a surveillance in old age homes in a Bangalore,  there was very high prevalence of 17.6% (109/612 residents) of Parkinsonism. This may be due to unawareness of this disorder among the general population who do not avail the medical facilities at the appropriate time. The prevalence rate in Europe is 1.8 per 100 in population above 65 years. As the prevalence of PD in non-white population is lower, the normal human brains from India and United Kingdom were compared, to determine the cause. The neurons which were melanized in substantia nigra (pars compacta), as the age increases, were counted and compared. Indian brains, though had low number of melanized neurons, the decrease in these number of neurons with age was much less compared to the whites. But a similar study comparing Nigerian and British brains  did not show any difference between these two ethnic groups. In one clinical study comparing the prevalence of PD in different ethnic groups in India,  Anglo-Indians, who had admixed ethnicity with Indian population had nearly five times lesser prevalence of PD compared to general Indian population. In summary, there may be several other factors causing the difference in prevalence in varied populations and this need to be explored. In most studies, it has been found that women have lesser prevalence of PD. A study at All India Institute of Medical Sciences (AIIMS) by Yadav et al.,  showed that women with higher number and longer duration of pregnancies had lesser prevalence of PD. This may indicate a protective role of estrogen. Most of the prevalence studies have used different methods to screen the population. Tanner et al.,  devised one of the widely used validated screening questionnaires for PD. Sarangmath et al., from National Institute of Mental Health and Neurosciences (NIMHANS)  have modified the screening questionnaire by Tanner et al., to cater to the varying literacy levels and different languages used in India. A few changes were made from the prior standard screening questionnaire and this was found to have good sensitivity even when administered by a nonmedical assistant. The epidemiology of PD in India is different compared to populations from different countries and also among different ethnicities in India [Table 3]. The prevalence studies in India are done among small population from specific areas probably with a particular type of cultural background. So, to generalize it to the rest of the population in a country where there is a huge cultural, ethnic, and social difference may not be correct. Hence, large multicenter studies for evaluating prevalence at different parts of the country are necessary. Till recently, PD was considered to be a geriatric disease. However, in the past few decades it has been well established that several genetic and familial forms of PD can occur. Early onset PD (EOPD) with onset of motor symptoms at £40 years, constitute approximately 5-10% of patients. EOPD can be further divided into young onset PD (YOPD; age at onset 20-40 years) and juvenile PD (JP; age of onset <20 years). In an Indian study comparing the clinical features of EOPD,  patients with JP had a higher incidence of dystonia, family history of Parkinsonism, and abnormalities in autonomic function tests [Table 4]. An unselected PD population attending AIIMS was studied by Denny and Behari to assess the factors responsible for motor fluctuations. Similar to a previous study,  the prevalence of dyskinesias was around 50% in Indian population, though the mean dose of LD causing dyskinesias was much lower. PD has a large spectrum of clinical features ranging from motor to nonmotor symptoms. Some of these nonmotor symptoms can result in greater morbidity than the motor symptoms themselves. Some of the nonmotor symptoms can occur as part of aging. PD patients and age-matched healthy controls were assessed by Krishnan et al.,  using Nonmotor Symptom Scale questionnaire,  to determine if there is any difference in the occurrence of these symptoms and the burden caused by them. The prevalence of these symptoms was higher and more severe in PD patients compared to normal ageing people. Cardiovascular symptoms, perceptual problems, hallucinations, cognition, and mood changes were significantly more in PD patients. Olfactory dysfunction can precede motor symptoms in PD Indian Smell identification Test (INSIT),  and was designed and compared with the standard Sniffin' Stick test. The smells used in this test were those that are familiar in the Indian population. INSIT showed a sensitivity of 79.2% and specificity of 78%. INSIT has been recommended as cheaper and convenient alternative to test for olfactory function in the Indian population. Basal ganglia is known to be involved in response inhibition through frontal subcortical circuits. Studies using no-no go test have shown the involvement of somatomotor loop of frontal subcortical circuit in PD patients. , An Indian study by Joti et al.,  assessed the oculomotor loop by testing a visually-guided saccadic task. Compared to normal subjects, PD patients were found to have delayed switching of the saccade from one target to another. This proves that basal ganglia are not only involved in the somatomotor loop but also in the oculomotor loop of frontal subcortical circuit. Speech impairment has been reported in 60-80% of the PD patients which reaches up to 100% in the later stages. Lazarus et al., subjected PD patients to the Indian Speech and Hearing Association (ISHA) articulation assessment and the Vaghmi software. It was found that 64.7% had slow reading speed, 60.2% hoarseness of voice, 39.8% articulatory defect, and 32.3% jerky speech. Articulation defects were most commonly seen with the labial syllables (42.1%), followed by the lingual and the palatal. In a study by Sachin et al., the speech profiles of PD patients were compared with patients with other types of atypical Parkinsonism such as progressive supranuclear palsy (PSP) and multiple system atrophy (MSA). PD patients had hypophonic monotonous speech with occasional rushes of speech, while PSP and MSA had spastic and ataxic components. Sachin et al., further evaluated the central mechanisms for speech impairment in PD patients using functional magnetic resonance imaging (fMRI) studies. They compared these results with PSP patients. It was found that for a sustained phonemic task in fMRI, superior temporal gyrus was activated in PD and occipital cortex in PSP. Impulse control disorders (ICD) are common in patients undergoing dopaminergic therapy. The prevalence of ICD is reported to vary in studies done in different countries, ranging from 3.5 to 35%. ,,, Sarathchandran et al., studied its occurrence in Indian PD population and reported a prevalence of 31.6%. These patients were having at least one ICD, punding being the most common (15.7%). Few of these patients (7.5%) had more than one ICD. Treatment of PD patients with dopamine agonist was found to be the most important factor for the occurrence of ICD in them. Respiratory dysfunction in PD is well-known and causes both obstructive and restrictive patterns. In a study conducted in India by Sathyaprabha et al.,  the effect on pulmonary functions in asymptomatic PD patients after treatment with LD was analyzed. Of these, 94% had restrictive pattern, signifying that there may be chest wall rigidity which contributed to the low chest wall compliance. The dysfunction was mitigated with medications (LD), probably due to the reduction in rigidity and bradykinesia leading to better coordination of muscles. In another similar study by Pal et al.,  women were found to be more affected, with poorer pulmonary functions. The pulmonary functions improved with the administration of LD, though they did not improve up to the control values. Routine pulmonary function monitoring, even in asymptomatic patients, may be necessary to anticipate any significant respiratory dysfunction and consequent effective intervention. Genetically mediated PD is associated with other unusual manifestations such as peripheral neuropathy. Juvenile PD patients from India, when evaluated for subclinical involvement using electroneuromyography, more than 50% had abnormalities. They had chronic partial denervation with reinnervation (34.6%), abnormalities of motor conduction (13.8%) and sensory conduction (31.9%), and abnormal sympathetic skin response (37.9%). Several neuropsychiatric manifestations such as depression, anxiety, and sleep disturbances have been described in PD. The prevalence of depression in PD patients ranges from 7.7 to 76%, , of which community-based studies  showed lower prevalence. Depression in PD may be reactive depression as a result of chronic illness as well as a result of neurodegeneration. The degeneration of subcortical nuclei such as hypothalamus, locus coeruleus, dorsal raphe, and ventral tegmental area and loss of dopamine and noradrenaline innervation in the limbic system have been implicated as a cause of depression in the PD patients. , Depression affects the cognition and quality of life (QOL). A study comparing PD and other chronic illnesses  revealed higher prevalence of depression in PD. They also had significantly higher disability and poorer QOL. As frontobasal circuitry is involved in obsessive compulsive disorder (OCD), some studies have tried to find if there is any association between PD and OCD. Harbishettar et al., in a study of 69 PD patients with normal cognition and 69 matched medically-ill controls, failed to show any association between OCD and PD. This could be due to the reason that different circuitries may be involved in these two disorders. Psychosis can also be a part of nonmotor spectrum of PD. It may be disabling to the patients and its presence may also warrant change in treatment strategies. The manifestations include hallucinations and delusions. In a study from India by Amar et al., 40 patients of PD with psychosis were assessed. Pure hallucinations were commonest in these patients (85%) and a combination of delusions and hallucinations was found in 7.5%. Of these visual hallucinations were predominant, amounting to 60%. Random eye motion (REM) sleep behavior disorder (RBD) can precede PD motor symptoms by many years. In an evaluation of RBD in PD patients in India,  the prevalence was 19.2%, similar to that found from other studies. Comparing the clinical features of patients with or without RBD, visual hallucinations and sleep disturbances such as insomnia and snoring were more in the RBD group. Comparing the sleep disturbances in idiopathic and familial forms of PD,  RBD and insomnia was higher in idiopathic PD. Other sleep disorders apart from RBD which have been reported from Indian population  include insomnia (32%), nightmares (32%), and excessive day time sleepiness (15%). Excessive day time sleepiness correlated with higher Unified Parkinson's Disease Rating Scale (UPDRS) and Hoehn and Yahr stage. Patients with sleep disturbances are more susceptible for mood disorders, have decreased QOL and increased caregiver burden. Comparing the young and late onset PD,  Mahale et al., found that RBD was more common in older patients and those who were in advanced stage of the disease. Those with RBD had poorer quality of sleep and excessive daytime sleepiness. Postural imbalance forms one of the important features of PD. Till date there are only few studies that addressed the quantitative evaluation of balance impairment in PD. Ganesan et al., used dynamic post urography to evaluate 20 PD patients with no symptoms of postural imbalance and normal pull test. There was direction-specific imbalance, predominantly in forward-right and backward-left positions in PD patients compared to the controls. Based on these findings, the authors suggested that a modified diagonal pull test may be helpful to detect subtle postural imbalance in early stage of PD. Nallegowda et al., in their pilot study showed that the imbalance in PD is due to a combined effect of reduction in muscle strength, decreased proprioception, visual sense, and narrow base of support. In on state, muscle strength, gait speed, and use of ankle strategy improve significantly. Genetic PD, found in less than 10% of PD, is caused by single gene Mendelian disorder. The idiopathic type of PD is attributed to the complex interaction between genetic susceptibility and environmental factors. There is a significant difference in prevalence of PD in India compared to other population, and there are differences in the normal brain specimens of different ethnic populations. , So it is likely that the genetic factors causing PD may also vary in different populations. So it was hypothesized that the incidence and profile of genetic forms of PD in Indian population may be different. Several studies have reported that the genetic forms of PD in India may differ from those occurring in the Western countries [Table 5]. Alpha-synuclein (SNCA) gene mutations causing PARK-1 and PARK-4, is found in 1.7-2.7% , of patients with familial PD and 0.3% in patients with isolated PD  in different populations. In the three Indian studies from northern and southern regions, none of the patients had mutations of SNCA gene. ,, Parkin gene mutations which are autosomal recessive, are the commonest mutations in YOPD. 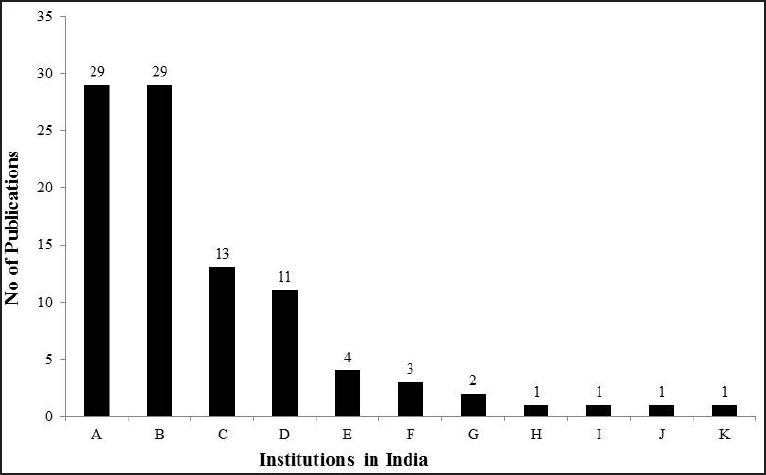 Prevalence of parkin gene in PD has been reported from five studies in India. In these studies, ,, the presence of parkin gene in all patients of PD was found to be similar ranging from 7.24 to 8.7%. However, when parkin mutations were specifically looked for in EOPD,  Parkin mutations were present in 2% of all EOPD, 10% of familial EOPD, and 25% of autosomal recessive EOPD. Only one study showed very high prevalence of about 68% in YOPD patients. Studies from other countries have reported the incidence of parkin in YOPD which ranged from 3.1 to 49%. , So, the Indian population seem to have relatively lesser incidence of parkin mutation. In summary, there are only very few studies from India that have systematically looked into the genetic profile of PD patients in India. Though the data from the available studies indicate that the underlying genetic factors in causation of PD may be different from the other populations, there needs to be more research in this area before any conclusions can be drawn. There are only a few clinical studies on imaging in PD reported from India. Gupta et al., compared the pattern of mineralization in susceptibility weighted imaging (SWI) in PD and atypical Parkinsonism. The hypointensity score of red nucleus, putamen, and substantia nigra was found to be significantly more in patients with PSP compared to PD and MSA. A study by Muthane et al., at NIMHANS compared the normal human brains from India and from United Kingdom. The neurons which were melanized in substantia nigra (pars compacta), as the age increases, were counted and compared. Indian brains, though had low number of melanized neurons, the decrease in these number of neurons with age was much less compared to the white population. This may give us a clue regarding the relatively lesser incidence of PD in Indian population. In a series of 29 patients who underwent pallidotomy for PD, Kishore et al., explored the functional somatotopy of globuspallidus (GPi). They found that ventral GPi lesion significantly improved LID. In India, many patients seek alternative medicine, especially in chronic diseases. Ayurveda is the most common alternative medicine available in the country. For PD, their treatment includes a mixture of cow's milk, Mucuna pruriens, Hyoscyamus reticulatus seeds, Withania somnifera, and Sida cordifolia roots. In this study, UPDRS and activities of daily living were assessed following the administration of above medications. Those who underwent cleansing or eliminating therapy (panchakarma) prior to the intake of medicines had significantly better outcomes. In India, a patient spends around 16-41.7% of the income for medications. Though cost of treatment in India is lesser, it is still out of reach of many patients. To consider surgical options, when necessary, may be much more difficult in patients of lower socioeconomic status. Patients with PD, because of their disability, can have poor QOL-physical, psychological, and social. Several studies have shown significant decrease in QOL in these patients. , The important clinical variables found to cause lower QOL in India were depression, disease severity, disability in off periods, dyskinesias, postural instability, gait disturbances, and cognitive dysfunction. The QOL was also found to be influenced by disease stage, severity, duration, and financial security. Indians had lesser disturbances in family and communal relationships due to the disease, probably due to stronger family bonds in their families. In this study, only 25% of patients responded to questions regarding sexual functions. This was probably due to the inhibitions among Indian people to discuss the sexual issues. This review shows that there is paucity of literature about PD in India. There are very few centers which are doing research in this field. This review shows that the Indian population may differ from the rest of the world in the context of PD, be it epidemiology or genetics or response to treatment. But systematic large-scale studies are scarce to make definite conclusions. The social and psychological issues in our patients are also different. More research needs to be encouraged, so that the characteristics of the disease in the Indian population can be understood better. We would suggest that elaborate research on genetic and therapeutic aspects is necessary. A combined effort of neurologists and other clinicians like psychiatrists, physical therapists, and basic sciences personnel would help in improving the quality of research. This would lead to better treatment options tailored to the needs of our patients in India. Pearce JM. Aspects of the history of Parkinson's disease. J Neurol Neurosurg Psychiatry 1989;Suppl:6-10. Singhal B, Lalkaka J, Sankhla C. Epidemiology and treatment of Parkinson's disease in India. Parkinsonism Relat Disord 2003;9 Suppl 2:S105-9. Bharucha NE, Bharucha EP, Bharucha AE, Bhise AV, Schoenberg BS. Prevalence of Parkinson's disease in the Parsi community of Bombay, India. Arch Neurol 1988;45:1321-3. Ragothaman M, Murgod UA, Gururaj G, Louis ED, Subbakrishna DK, Muthane UB. High occurrence and low recognition of Parkinsonism (and possible PD) in old age homes in Bangalore, South India. J Assoc Physicians India 2008;56:233-6.
de Rijk MC, Launer LJ, Berger K, Breteler MM, Dartigues JF, Baldereschi M, et al. Prevalence of Parkinson's disease in Europe: A collaborative study of population-based cohorts. Neurologic Diseases in the Elderly Research Group. Neurology 2000;54(11 Suppl 5):S21-3. Muthane UB, Chickabasaviah YT, Henderson J, Kingsbury AE, Kilford L, Shankar SK, et al. Melanized nigral neuronal numbers in Nigerian and British individuals. Mov Disord 2006;21:1239-41. Ragothaman M, Murgod UA, Gururaj G, Kumaraswamy SD, Muthane U. Lower risk of Parkinson's disease in an admixed population of European and Indian origins. Mov Disord 2003;18:912-4. Yadav R, Shukla G, Goyal V, Singh S, Behari M. A case control study of women with Parkinson's disease and their fertility characteristics. J Neurol Sci 2012;319:135-8. CM T, DW G, CG G. A brief screening questionnaire for parkinsonism [abstract]. Ann Neurol 1990:267-88. Sarangmath N, Rattihalli R, Ragothaman M, Gopalkrishna G, Doddaballapur S, Louis ED, et al. Validity of a modified Parkinson's disease screening questionnaire in India: Effects of literacy of participants and medical training of screeners and implications for screening efforts in developing countries. Mov Disord 2005;20:1550-6. Behari M, Srivastava AK, Das RR, Pandey RM. Risk factors of Parkinson's disease in Indian patients. J Neurol Sci 2001;190:49-55.
de Lau LM, Giesbergen PC, de Rijk MC, Hofman A, Koudstaal PJ, Breteler MM. Incidence of parkinsonism and Parkinson disease in a general population: The Rotterdam Study. Neurology 2004;63:1240-4. Benito-Leon J, Bermejo-Pareja F, Morales-Gonzalez JM, Porta-Etessam J, Trincado R, Vega S, et al. Incidence of Parkinson disease and parkinsonism in three elderly populations of central Spain. Neurology 2004;62:734-41. Baldereschi M, Di Carlo A, Rocca WA, Vanni P, Maggi S, Perissinotto E, et al. Parkinson's disease and parkinsonism in a longitudinal study: Two-fold higher incidence in men. ILSA Working Group. Italian Longitudinal Study on Aging. Neurology 2000;55:1358-63. Priyadarshi A, Khuder SA, Schaub EA, Priyadarshi SS. Environmental risk factors and Parkinson's disease: A metaanalysis. Environ Res 2001;86:122-7. Seidler A, Hellenbrand W, Robra BP, Vieregge P, Nischan P, Joerg J, et al. Possible environmental, occupational, and other etiologic factors for Parkinson's disease: A case-control study in Germany. Neurology 1996;46:1275-84. De Michele G, Filla A, Volpe G, De Marco V, Gogliettino A, Ambrosio G, et al. Environmental and genetic risk factors in Parkinson's disease: A case-control study in southern Italy. Mov Disord 1996;11:17-23. Hofman A, Collette HJ, Bartelds AI. Incidence and risk factors of Parkinson's disease in The Netherlands. Neuroepidemiology 1989;8:296-9. Rahman M, Fukui T. Bidi smoking and health. Public Health 2000;114:123-7. Kadakol G, Kulkarni SS, Kulkarni BB, Kulkarni SS. Bhaskar LVKS, Wali GM, Nadgir D, Hiremath SV, Gai PB. Parkinson's disease in North Karnataka: An epidemiological perspective. J Anthropol 2012, vol. 8. n. 1 - ISSN 1973- 2880. Lesage S, Brice A. Parkinson's disease: From monogenic forms to genetic susceptibility factors. Hum Mol Genet 2009;18(R1):R48-59. Muthane UB, Swamy HS, Satishchandra P, Subhash MN, Rao S, Subbakrishna D. Early onset Parkinson's disease: Are juvenile- and young-onset different? Mov Disord 1994;9:539-44. Denny AP, Behari M. Motor fluctuations in Parkinson's disease. J Neurol Sci 1999;165:18-23. Markham CH, Diamond SG. Evidence to support early levodopa therapy in Parkinson disease. Neurology 1981;31:125-31. Krishnan S, Sarma G, Sarma S, Kishore A. Do nonmotor symptoms in Parkinson's disease differ from normal aging? Mov Disord 2011;26:2110-3. Chaudhuri KR, Martinez-Martin P, Schapira AH, Stocchi F, Sethi K, Odin P, et al. International multicenter pilot study of the first comprehensive self-completed nonmotor symptoms questionnaire for Parkinson's disease: The NMSQuest study. Mov Disord 2006;21:916-23. George J, Jose T, Behari M. Use of Indian smell identification test for evaluating olfaction in idiopathic Parkinson's disease patients in India. Neurol India 2013;61:365-70. Strick PL, Dum RP, Mushiake H. Basal ganglia 'loops' with the cerebral cortex. Functions of the cortico-basal ganglia loop 1995; p. 106-124. Ilinsky IA, Jouandet ML, Goldman-Rakic PS. Organization of the nigrothalamocortical system in the rhesus monkey. J Comp Neurol 1985;236:315-30.
Cooper JA, Sagar HJ, Tidswell P, Jordan N. Slowed central processing in simple and go/no-go reaction time tasks in Parkinson's disease. Brain 1994;117:517-29. Joti P, Kulashekhar S, Behari M, Murthy A. Impaired inhibitory oculomotor control in patients with Parkinson's disease. Exp Brain Res 2007;177:447-57. Streifler M, Hofman S. Disorders of verbal expression in parkinsonism. Adv Neurol 1984;40:385-93. Lazarus JP, Vibha D, Handa KK, Singh S, Goyal V, Srivastava T, et al. A study of voice profiles and acoustic signs in patients with Parkinson's disease in North India. J Clin Neurosci 2012;19:1125-9. Sachin S, Shukla G, Goyal V, Singh S, Aggarwal V, Gureshkumar, et al. Clinical speech impairment in Parkinson's disease, progressive supranuclear palsy, and multiple system atrophy. Neurol India 2008;56:122-6. Sachin S, Senthil Kumaran S, Singh S, Goyal V, Shukla G, Mahajan H, et al. Functional mapping in PD and PSP for sustained phonation and phoneme tasks. J Neurol Sci 2008;273:51-6. Angelini M, Negrotti A, Marchesi E, Bonavina G, Calzetti S. A study of the prevalence of restless legs syndrome in previously untreated Parkinson's disease patients: Absence of co-morbid association. J Neurol Sci 2011;310:268-8. Nomura T, Inoue Y, Miyake M, Yasui K, Nakashima K. Prevalence and clinical characteristics of restless legs syndrome in Japanese patients with Parkinson's disease. Mov Disord 2006;21:380-4. Bhalsing K, Suresh K, Muthane UB, Pal PK. Prevalence and profile of Restless Legs Syndrome in Parkinson's disease and other neurodegenerative disorders: A case-control study. Parkinsonism Relat Disord 2013;19:426-30. Krishnan PR, Bhatia M, Behari M. Restless legs syndrome in Parkinson's disease: A case-controlled study. Mov Disord 2003;18:181-5. Fan W, Ding H, Ma J, Chan P. Impulse control disorders in Parkinson's disease in a Chinese population. Neurosci Lett 2009;465:6-9. Lee JY, Kim JM, Kim JW, Cho J, Lee WY, Kim HJ, et al. Association between the dose of dopaminergic medications and the behavioral disturbances in Parkinson disease. Parkinsonism Relat Disord 2010;16:202-7. Auyeung M, Tsoi TH, Tang WK, Cheung CM, Lee CN, Li R, et al. Impulse control disorders in Chinese Parkinson's disease patients: The effect of ergot derived dopamine agonist. Parkinsonism Relat Disord 2011;17:635-7. Lim SY, Tan ZK, Ngam PI, Lor TL, Mohamed H, Schee JP, et al. Impulsive-compulsive behaviours are common in Asian Parkinson's disease patients: Assessment using the QUIP. Parkinsonism Relat Disord 2011;17:761-4. Sarathchandran P, Soman S, Sarma G, Krishnan S, Kishore A. Impulse control disorders and related behaviors in Indian patients with Parkinson's disease. Mov Disord 2013;28:1901-2.
Cooper JA, Sagar HJ, Jordan N, Harvey NS, Sullivan EV. Cognitive impairment in early, untreated Parkinson's disease and its relationship to motor disability. Brain 1991;114 (Pt 5):2095-122. Singh S, Behari M. Verbal and visual memory in patients with early Parkinson's disease: Effect of levodopa. Neurol India 2006;54:33-7. Dixit SN, Behari M, Ahuja GK. Effect of selegiline on cognitive functions in Parkinson's disease. J Assoc Physicians India 1999;47:784-6. Krishnan S, Mathuranath PS, Sarma S, Kishore A. Neuropsychological functions in progressive supranuclear palsy, multiple system atrophy and Parkinson's disease. Neurol India 2006;54:268-72. Sabate M, Rodriguez M, Mendez E, Enriquez E, Gonzalez I. Obstructive and restrictive pulmonary dysfunction increases disability in Parkinson disease. Arch Phys Med Rehabil 1996;77:29-34. Sathyaprabha TN, Kapavarapu PK, Pall PK, Thennarasu K, Raju TR. Pulmonary functions in Parkinson's disease. Indian J Chest Dis Allied Sci 2005;47:251-7. Pal PK, Sathyaprabha TN, Tuhina P, Thennarasu K. Pattern of subclinical pulmonary dysfunctions in Parkinson's disease and the effect of levodopa. Mov Disord 2007;22:420-4. Magalhaes M, Wenning GK, Daniel SE, Quinn NP. Autonomic dysfunction in pathologically confirmed multiple system atrophy and idiopathic Parkinson's disease--a retrospective comparison. Acta Neurol Scand 1995;91:98-102. Mesec A, Sega S, Trost M, Pogacnik T. The deterioration of cardiovascular reflexes in Parkinson's disease. Acta Neurol Scand 1999;100:296-9. Sriranjini SJ, Ganesan M, Datta K, Pal PK, Sathyaprabha TN. Effect of a single dose of standard levodopa on cardiac autonomic function in Parkinson's disease. Neurol India 2011;59:659-63. Jamnadas-Khoda J, Koshy S, Mathias CJ, Muthane UB, Ragothaman M, Dodaballapur SK. Are current recommendations to diagnose orthostatic hypotension in Parkinson's disease satisfactory? Mov Disord 2009;24:1747-51. Ragothaman M, Swaminath PV, Sarangmath N, Koshy S, Adhyam M, Subbakrishna DK, et al. Role of dysautonomic symptoms in distinguishing Parkinson's disease (PD) from multiple system atrophy (MSA-P) within a year of developing motor symptoms. J Assoc Physicians India 2011;59:95-8. Swaminath PV, Ragothaman M, Koshy S, Sarangmath N, Adhyam M, Subbakrishna DK, et al. Urogenital symptoms in Parkinson's disease and multiple system atrophy-Parkinsonism: At onset and later. J Assoc Physicians India 2010;58:86-90. Taly AB, Muthane UB. Involvement of peripheral nervous system in juvenile Parkinson's disease. Acta Neurol Scand 1992;85:272-5. Tandberg E, Larsen JP, Aarsland D, Cummings JL. The occurrence of depression in Parkinson's disease. A community-based study. Arch Neurol 1996;53:175-9. Happe S, Schrodl B, Faltl M, Muller C, Auff E, Zeitlhofer J. Sleep disorders and depression in patients with Parkinson's disease. Acta Neurol Scand 2001;104:275-80. Blandini F, Nappi G, Tassorelli C, Martignoni E. Functional changes of the basal ganglia circuitry in Parkinson's disease. Prog Neurobiol 2000;62:63-88. Remy P, Doder M, Lees A, Turjanski N, Brooks D. Depression in Parkinson's disease: Loss of dopamine and noradrenaline innervation in the limbic system. Brain 2005;128(Pt 6):1314-22. Schrag A. Quality of life and depression in Parkinson's disease. J Neurol Sci 2006;248(1-2):151-7. Harbishettar V, Pal PK, Janardhan Reddy YC, Thennarasu K. Is there a relationship between Parkinson's disease and obsessive-compulsive disorder? Parkinsonism Relat Disord 2005;11:85-8. Amar BR, Yadav R, Janardhan Reddy YC, Pal PK. A clinical profile of patients with Parkinson's disease and psychosis. Ann Indian Acad Neurol 2014;17:187-92. Vibha D, Shukla G, Goyal V, Singh S, Srivastava AK, Behari M. RBD in Parkinson's disease: A clinical case control study from North India. Clin Neurol Neurosurg 2011;113:472-6. Gjerstad MD, Boeve B, Wentzel-Larsen T, Aarsland D, Larsen JP. Occurrence and clinical correlates of REM sleep behaviour disorder in patients with Parkinson's disease over time. J Neurol Neurosurg Psychiatry 2008;79:387-91. Vibha D, Shukla G, Singh S, Goyal V, Srivastava AK, Behari M. Lower prevalence of sleep disturbances in familial versus sporadic Parkinson's disease: A questionnaire based study. J Neurol Sci 2010;295:27-30. Kumar S, Bhatia M, Behari M. Sleep disorders in Parkinson's disease. Mov Disord 2002;17:775-81. Kumar S, Bhatia M, Behari M. Excessive daytime sleepiness in Parkinson's disease as assessed by Epworth Sleepiness Scale (ESS). Sleep Med 2003;4:339-42. Agrawal V, Goyal V, Shukla G, Behari M. Predictors of caregivers' burden of Parkinson's disease in India: Experience of a tertiary care center in India. J Parkinsons Restless Legs Syndrome 2012;2:59-65. Mahale R, Yadav R, Pal PK. Rapid eye movement sleep behaviour disorder in young- and older-onset Parkinson disease: A questionnaire-based study. Sleep Med 2014;15:642-6. Ganesan M, Pal PK, Gupta A, Sathyaprabha TN. Dynamic posturography in evaluation of balance in patients of Parkinson's disease with normal pull test: Concept of a diagonal pull test. Parkinsonism Relat Disord 2010;16:595-9. Nallegowda M, Singh U, Handa G, Khanna M, Wadhwa S, Yadav SL, et al. Role of sensory input and muscle strength in maintenance of balance, gait, and posture in Parkinson's disease: A pilot study. Am J Phys Med Rehabil 2004;83:898-908. Muthane U, Jain S, Gururaj G. Hunting genes in Parkinson's disease from the roots. Med Hypotheses 2001;57:51-5. Farrer M, Kachergus J, Forno L, Lincoln S, Wang DS, Hulihan M, et al. Comparison of kindreds with parkinsonism and alpha-synuclein genomic multiplications. Ann Neurol 2004;55:174-9. Ibanez P, Lesage S, Janin S, Lohmann E, Durif F, Destee A, et al. Alpha-synuclein gene rearrangements in dominantly inherited parkinsonism: Frequency, phenotype, and mechanisms. Arch Neurol 2009;66:102-8. Ahn TB, Kim SY, Kim JY, Park SS, Lee DS, Min HJ, et al. alpha-Synuclein gene duplication is present in sporadic Parkinson disease. Neurology 2008;70:43-9. Nagar S, Juyal RC, Chaudhary S, Behari M, Gupta M, Rao SN, et al. Mutations in the alpha-synuclein gene in Parkinson's disease among Indians. Acta Neurol Scand 2001;103:120-2. Kadakol GS, Kulkarni SS, Wali GM, Gai PB. Molecular analysis of alpha-synuclein gene in Parkinson's disease in North Karnataka, India. Neurol India 2014;62:149-52. Vishwanathan Padmaja M, Jayaraman M, Srinivasan AV, Srikumari Srisailapathy CR, Ramesh A. The SNCA (A53T, A30P, E46K) and LRRK2 (G2019S) mutations are rare cause of Parkinson's disease in South Indian patients. Parkinsonism Relat Disord 2012;18:801-2. Chaudhary S, Behari M, Dihana M, Swaminath PV, Govindappa ST, Jayaram S, et al. 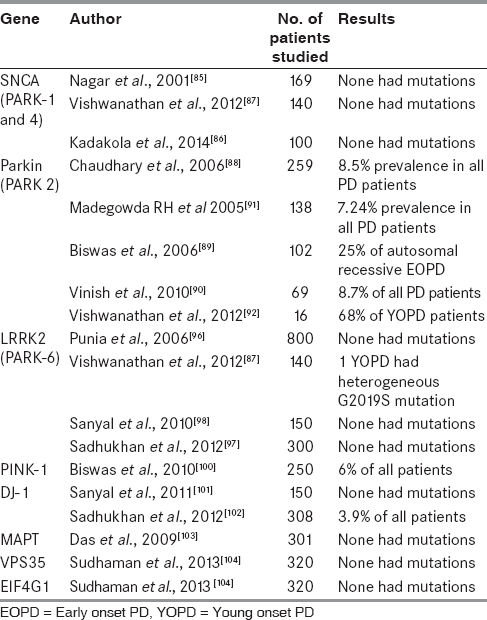 Parkin mutations in familial and sporadic Parkinson's disease among Indians. Parkinsonism Relat Disord 2006;12:239-45. Biswas A, Gupta A, Naiya T, Das G, Neogi R, Datta S, et al. Molecular pathogenesis of Parkinson's disease: Identification of mutations in the Parkin gene in Indian patients. Parkinsonism Relat Disord 2006;12:420-6. Vinish M, Prabhakar S, Khullar M, Verma I, Anand A. Genetic screening reveals high frequency of PARK2 mutations and reduced Parkin expression conferring risk for Parkinsonism in North West India. J Neurol Neurosurg Psychiatry 2010;81:166-70. Madegowda RH, Kishore A, Anand A. Mutational screening of the parkin gene among South Indians with early onset Parkinson's disease. J Neurol Neurosurg Psychiatry 2005;76:1588-90. Padmaja MV, Jayaraman M, Srinivasan AV, Srisailapathy CR, Ramesh A. PARK2 gene mutations in early onset Parkinson's disease patients of South India. Neurosci Lett 2012;523:145-7. Lucking CB, Durr A, Bonifati V, Vaughan J, De Michele G, Gasser T, et al. French Parkinson's Disease Genetics Study Group; European Consortium on Genetic Susceptibility in Parkinson's Disease. Association between early-onset Parkinson's disease and mutations in the parkin gene. N Engl J Med 2000;342:1560-7. Haylett WL, Keyser RJ, du Plessis MC, van der Merwe C, Blanckenberg J, Lombard D, et al. Mutations in the parkin gene are a minor cause of Parkinson's disease in the South African population. Parkinsonism Relat Disord 2012;18:89-92. Khan NL, Jain S, Lynch JM, Pavese N, Abou-Sleiman P, Holton JL, et al. Mutations in the gene LRRK2 encoding dardarin (PARK8) cause familial Parkinson's disease: Clinical, pathological, olfactory and functional imaging and genetic data. Brain 2005;128(Pt 12): 2786-96. Punia S, Behari M, Govindappa ST, Swaminath PV, Jayaram S, Goyal V, et al. Absence/rarity of commonly reported LRRK2 mutations in Indian Parkinson's disease patients. Neurosci Lett 2006;409:83-8. Sadhukhan T, Vishal M, Das G, Sharma A, Mukhopadhyay A, Das SK, et al. Evaluation of the role of LRRK2 gene in Parkinson's disease in an East Indian cohort. Dis Markers 2012;32:355-62. Sanyal J, Sarkar B, Ojha S, Banerjee TK, Ray BC, Rao VR. Absence of commonly reported leucine-rich repeat kinase 2 mutations in Eastern Indian Parkinson's disease patients. Genet Test Mol Biomarkers 2010;14:691-4. Rogaeva E, Johnson J, Lang AE, Gulick C, Gwinn-Hardy K, Kawarai T, et al. Analysis of the PINK1 gene in a large cohort of cases with Parkinson disease. Arch Neurol 2004;61:1898-904. Biswas A, Sadhukhan T, Majumder S, Misra AK, Das SK, Variation Consortium IG, et al. Evaluation of PINK1 variants in Indian Parkinson's disease patients. Parkinsonism Relat Disord 2010;16:167-71. Sanyal J, Sarkar B, Banerjee TK, Mukherjee SC, Ray BC, Raghavendra Rao V. Evaluating intra-genetic variants of DJ-1 among Parkinson's disease patients of eastern India. Neurol Res 2011;33:349-53. 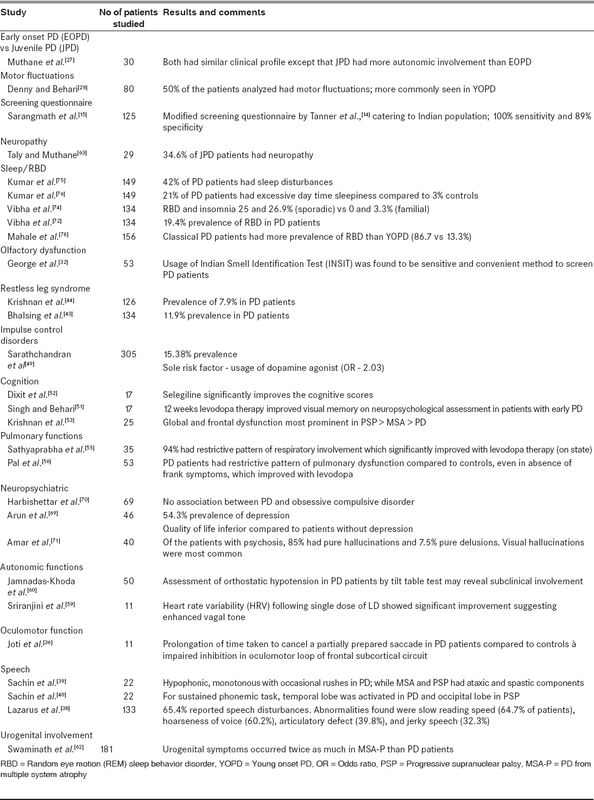 Sadhukhan T, Biswas A, Das SK, Ray K, Ray J. DJ-1 variants in Indian Parkinson's disease patients. Dis Markers 2012;33:127-35. Das G, Misra AK, Das SK, Ray K, Ray J. Microtubule-associated protein tau (MAPT) influences the risk of Parkinson's disease among Indians. Neurosci Lett 2009;460:16-20. Sudhaman S, Behari M, Govindappa ST, Muthane UB, Juyal RC, Thelma BK. VPS35 and EIF4G1 mutations are rare in Parkinson's disease among Indians. Neurobiol Aging 2013;34:2442.e1-3. Ando M, Funayama M, Li Y, Kashihara K, Murakami Y, Ishizu N, et al. VPS35 mutation in Japanese patients with typical Parkinson's disease. Mov Disord 2012;27:1413-7. Vilarino-Guell C, Wider C, Ross OA, Dachsel JC, Kachergus JM, Lincoln SJ, et al. VPS35 mutations in Parkinson disease. Am J Hum Genet 2011;89:162-7. Chartier-Harlin MC, Dachsel JC, Vilarino-Guell C, Lincoln SJ, Lepretre F, Hulihan MM, et al. Translation initiator EIF4G1 mutations in familial Parkinson disease. Am J Hum Genet 2011;89:398-406. Chaudhary S, Behari M, Dihana M, Swaminath PV, Govindappa ST, Jayaram S, et al. Association of N-acetyl transferase 2 gene polymorphism and slow acetylator phenotype with young onset and late onset Parkinson's disease among Indians. Pharmacogenet Genomics 2005;15:731-5. Juyal RC, Das M, Punia S, Behari M, Nainwal G, Singh S, et al. Genetic susceptibility to Parkinson's disease among South and North Indians: I. Role of polymorphisms in dopamine receptor and transporter genes and association of DRD4 120-bp duplication marker. Neurogenetics 2006;7:223-9. Punia S, Das M, Behari M, Mishra BK, Sahani AK, Govindappa ST, et al. Role of polymorphisms in dopamine synthesis and metabolism genes and association of DBH haplotypes with Parkinson's disease among North Indians. Pharmacogenet Genomics 2010;20:435-41. Punia S, Das M, Behari M, Dihana M, Govindappa ST, Muthane UB, et al. Leads from xenobiotic metabolism genes for Parkinson's disease among north Indians. Pharmacogenet Genomics 2011;21:790-7. Hegde ML, Gupta VB, Anitha M, Harikrishna T, Shankar SK, Muthane U, et al. Studies on genomic DNA topology and stability in brain regions of Parkinson's disease. Arch Biochem Biophys 2006;449:143-56. Gupta D, Saini J, Kesavadas C, Sarma PS, Kishore A. Utility of susceptibility-weighted MRI in differentiating Parkinson's disease and atypical parkinsonism. Neuroradiology 2010;52:1087-94. Bodis-Wollner I, Yahr MD. Measurements of visual evoked potentials in Parkinson's disease. Brain 1978;101:661-71. Bodis-Wollner I, Onofjr M. The visual system in Parkinson's disease. Adv Neurol 1987; 45:323-7. Muthane UB, Satishchandra P, Subhash MN. Visual and auditory evoked potentials in early onset Parkinson's disease and their relationship to cerebrospinal fluid monoamine metabolites. Mov Disord 1993;8:344-8. Bhatia M, Johri S, Behari M. Increased cortical excitability with longer duration of Parkinson's disease as evaluated by transcranial magnetic stimulation. Neurol India 2003;51:13-5. 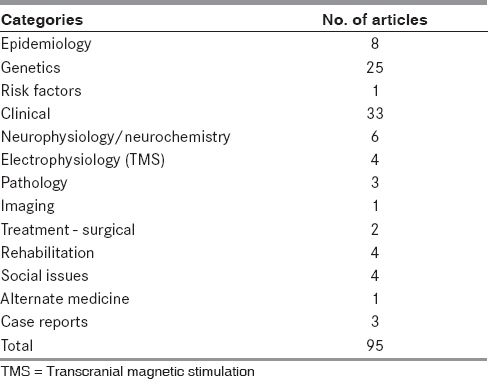 Maeda F, Keenan JP, Tormos JM, Topka H, Pascual-Leone A. Modulation of corticospinal excitability by repetitive transcranial magnetic stimulation. Clin Neurophysiol 2000;111:800-5. Kishore A, Popa T, Velayudhan B, Joseph T, Balachandran A, Meunier S. Acute dopamine boost has a negative effect on plasticity of the primary motor cortex in advanced Parkinson's disease. Brain 2012;135(Pt 7):2074-88. Kishore A, Popa T, Balachandran A, Chandran S, Pradeep S, Backer F, et al. Cerebellar sensory processing alterations impact motor cortical plasticity in Parkinson's disease: Clues from dyskinetic patients. Cereb Cortex 2014;24:2055-67. Abraham S, Soundararajan CC, Vivekanandhan S, Behari M. Erythrocyte antioxidant enzymes in Parkinson's disease. Indian J Med Res 2005;121:111-5. Sanyal J, Bandyopadhyay SK, Banerjee TK, Mukherjee SC, Chakraborty DP, Ray BC, et al. Plasma levels of lipid peroxides in patients with Parkinson's disease. Eur Rev Med Pharmacol Sci 2009;13:129-32. Mythri RB, Venkateshappa C, Harish G, Mahadevan A, Muthane UB, Yasha TC, et al. Evaluation of markers of oxidative stress, antioxidant function and astrocytic proliferation in the striatum and frontal cortex of Parkinson's disease brains. Neurochem Res 2011;36:1452-63. Kishore A, Rao R, Krishnan S, Panikar D, Sarma G, Sivasanakaran MP, et al. Long-term stability of effects of subthalamic stimulation in Parkinson's disease: Indian Experience. Mov Disord 2010;25:2438-44. Naskar S, Sood SK, Goyal V. Effect of acute deep brain stimulation of the subthalamic nucleus on auditory event-related potentials in Parkinson's disease. Parkinsonism Relat Disord 2010;16:256-60. Kishore A, Panikar D, Balakrishnan S, Joseph S, Sarma S. Evidence of functional somatotopy in GPi from results of pallidotomy. Brain 2000;123 Pt 12:2491-500. Nagashayana N, Sankarankutty P, Nampoothiri MR, Mohan PK, Mohanakumar KP. Association of L-DOPA with recovery following Ayurveda medication in Parkinson's disease. J Neurol Sci 2000;176:124-7. Ganesan M, Sathyaprabha TN, Gupta A, Pal PK. Effect of partial weight-supported treadmill gait training on balance in patients with Parkinson disease. PMR 2014;6:22-33. Winfree KN, Pretzer-Aboff I, Hilgart D, Aggarwal R, Behari M, Agrawal SK. The effect of step-synchronized vibration on patients with Parkinson's disease: Case studies on subjects with freezing of gait or an implanted deep brain stimulator. IEEE Trans Neural Syst Rehabil Eng 2013;21:806-11. Ganesan M, Pal PK, Gupta A, Sathyaprabha TN. Treadmill gait training improves baroreflex sensitivity in Parkinson's disease. Clin Auton Res 2014;24:111-8. Ragothaman M, Govindappa ST, Rattihalli R, Subbakrishna DK, Muthane UB. Direct costs of managing Parkinson's disease in India: Concerns in a developing country. Mov Disord 2006;21:1755-8. Kuopio AM, Marttila RJ, Helenius H, Toivonen M, Rinne UK. The quality of life in Parkinson's disease. Mov Disord 2000; 15:216-23. Karlsen KH, Tandberg E, Arsland D, Larsen JP. Health related quality of life in Parkinson's disease: A prospective longitudinal study. J Neurol Neurosurg Psychiatry 2000;69:584-9. Ray J, Das SK, Gangopadhya PK, Roy T. Quality of life in Parkinson's disease - Indian scenario. J Assoc Physicians India 2006;54:17-21. Yadav R, Shukla G, Goyal V, Singh S, Behari M. Knowledge of Parkinson's disease among patients and caregivers attending movement disorder clinic at a tertiary care centre in north India. Ann Indian Acad Neurol 2012;15:294-6.